Fees can occasionally be entered in an order that may be confusing on a statement. For example, when the statement is printed out, it might look like you reviewed a document before writing the first draft! In Version 19, you can use the Reorder Fees utility to change the order in which fees with the same date are displayed on a single statement. 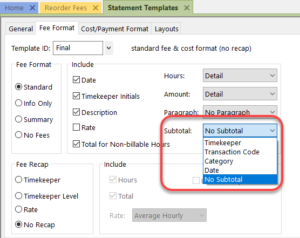 First, transactions are sorted by the Subtotal selected on the Fee Format tab of the Statement Template being used (i.e., No Subtotal, Timekeeper, Transaction Code, Category, or Date). Next, transactions are sorted by the Date of the transaction. Finally, transactions with the same date are sorted by the Reference number of the transaction. This is the order that can be modified using the Reorder Fees utility. The Reorder Fees utility (Statements | Statement Preparation | Reorder Fees) lists all work-in-process fees for the selected client. Fees can be moved using the Move Up and Move Down buttons. Moving fees up and down changes the reference number of the fee immediately. However, keep in mind that fees can only be moved up or down within the same date. For example, if there are three fees dated 2/15, and one fee dated 2/16, only the fees dated 2/15 can be moved. You can use the Group fees by drop-down option to see what order fees would be listed on a client’s statement based on the Subtotal selected in the Statement Template. When selecting Draft or Final, the fees will be grouped as specified in the Subtotal field of the selected client’s Draft or Final Statement Template. Take a look at how fees are shown on your clients’ statements, and see how the Reorder Fees utility can help you. Your clients will appreciate the order, and you might get paid faster! What I like most about this is I will no longer have to worry about the order in which I enter fees as I can easily adjust their order at a later time before billing.